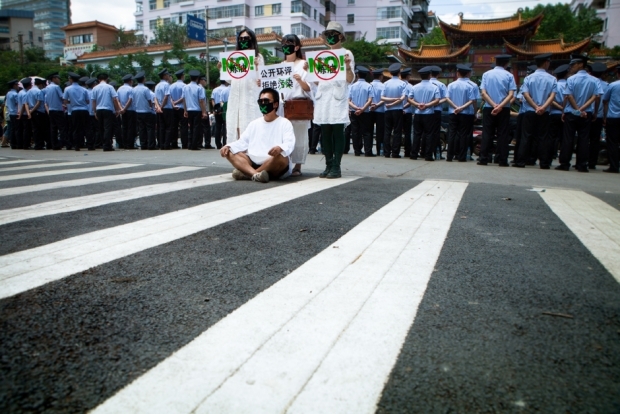 Demonstrators hold banner behind the police as they take part in a protest against plans for a petrochemical plant outside the provincial government building in Kunming, Yunnan province on May 16, 2013. Hundreds of people took part in this renewed protest against the proposed chemical plant on May 16, following an earlier one on May 4. By Tang Hao, a Deputy Professor at South China Normal University, Fulbright scholar, and columnist. This article was first published by chinadialogue. NIMBY—or “not in my backyard”—protests happen when residents attempt to protect their neighborhoods from the negative impacts of public or industrial facilities. Since the 2007 “walking protests” against a PX chemical factory in Xiamen, we have seen a halt called to another PX plant in Dalian, a copper and molybdenum refinery in Shifang, and incinerators in Panyu, Guangzhou, and Xierqi, Beijing. In each case, the project was shelved thanks to public opposition and protests. In China, pleasant living environments are getting harder to find—and scarcity leads to competition and conflict. As China has no mechanisms in place for managing such competition, the outcome is unruly conflict. And as the participants are not equal in power or organization, the fight is asymmetric. The rise of the NIMBY movement is generally blamed on failings of Chinese environmental governance. But the differing strength of different interest groups is the real cause. That imbalance allows the powerful to use the system to their advantage, while the weak resort to less rational or even illegal forms of protest. China’s central and local governments have always enjoyed a monopoly on power, with minimal checks and balances on policy decisions. Since the 1980s, the government, particularly at local level, has seen economic growth as the primary objective—whatever the method, whatever the cost, the economy must expand. This justifies the destruction of the environment. In support of the copper refinery, the Shifang government cited its impact on tax income, employment, and livelihoods. It was taken for granted that the environment could be sacrificed for these aims. A new stage of development will see the role of local government shift from ensuring economic growth to the provision of services, but this has so far had little impact on entrenched ideas on the source of legitimacy. However, the new emphasis on provision of services has given people unrealistic hopes that the government will act responsibly on the environment. The public’s hopes for an all-powerful government will always be disappointed, leading to greater anger. This is why China’s NIMBY campaigns often target government. Meanwhile, industry and business—the most powerful players in the contest for environmental resources—cosy up to government when starting new projects. This is true of both state and private sector firms. The close partnerships between business and local government ensure profits for both, while material resources concentrate in accordance with that age-old rule: the rich get richer while the poor get poorer. Of course, the government’s monopoly on power means business is not always on top. In Xiamen, Shifang, and Qidong, businesses lost out as projects were cancelled—pressure to maintain stability in the face of popular protest meant business interests were sacrificed. There was no compensation for corporate losses due to abandoned projects. The NIMBY movement has emerged alongside rising public awareness of environmental and rights issues. Local governments, business, and the public are tussling over the right to allocate resources and make policy decisions—and it is a lopsided struggle. Government and business are highly organized and form stable interest groups. Residents suffering the impacts of pollution, however, are unorganized. Often, they are more a number of people with a common interest than an actual interest group. Such groups struggle to act and exert influence in a rational manner, and they are unable to compete on equal terms with the other side. This means they cannot protect their interests by conventional means. China’s circumstances mean NIMBY campaigns sometimes succeed, but not because the public interest is being properly considered during the political decision-making process. Nor are they a solution for that failure. In NIMBY movements, with disorganized participants, the demands of the weak can be blown up to the extent they pose a threat to social stability. The greater the impact of the protests, the more likely government is to pay attention. But there is no consideration of which group deserves to get what—only of maintaining social stability. The incidents in Xiamen, Dalian, Tianjin, and Shifang were calmed by rushed announcements that the offending projects would be suspended. This was not a deliberation between different points of view, but an attempt to end a crisis, and clearly not an effective way to deal with NIMBY issues. With an imbalance of power and decision makers consciously or otherwise shirking their duties, the NIMBY problem may be insoluble. There is plenty of polluting public infrastructure that can’t simply be cancelled—incinerators, sewage treatment plants, power stations must be built in someone’s backyard. If there is no effective system for balancing interests and forming consensus, problems will just be shuffled around, and China will have neither social harmony nor scientific development. Even the sages told us problems cannot simply be dumped onto a neighbor’s land. China’s development may struggle in the future due to a failure to balance interests and form consensus. It isn’t the inevitable outcome. In the 1970s and 1980s, NIMBY movements in Europe and the U.S. spurred on the rule of law. Government management and public participation both improved. In Taiwan in the 1980s, the economy boomed and a movement with an even wider scope, to reinvent society, took shape. Taiwan’s NIMBY movement led to an environmental impact assessment law, with important safeguards for transparency and public participation. This allowed the public to act rationally, by ensuring the government did so first. If project details are presented to the public early and accurately, and public opinions are heard at consultations, NIMBYism will stay in the meeting hall. If different interest groups are able to express their views within the system, the need for protests vanishes. But in China today such a positive outcome is unlikely. Public environmental protests sometimes veer away from the rational and constructive, precisely because a lack of transparency prevents the formation of rational views. In environmental impact assessments, information is not open or transparent, and those most affected have no right to be heard and are not represented over compensation. The public are most closely affected by environmental problems, and in the majority of incidents are the weaker party—and often make angry demands. In the majority of cases these demands are just, but the movement itself and government handling of the protests do not create the mechanisms for involved parties to make rational decisions. With growing awareness of the public’s rights, more public participation is inevitable. Decisions impacting ordinary citizens’ environmental interests must be made more openly—not privately by the powerful. To achieve this, we need both to restrict those who monopolize power and resources, and to support greater organization for the weak. A society unable to protect the interests of the few will also be unable to protect the interests of the many. Fairness in environmental rights must be based on equality in civil rights.